First "Soviet" torpedo. Broadly based on the Russian 456 mm Pattern 1912 and 533 mm Pattern 1917 torpedoes. In production until 1935. Aircraft torpedo based on the shortened Pattern 1910/15 torpedo. Designed to be launched from 6,500-9,800 feet (2,000-3,000m) and used 3 drogue parachutes. Low altitude aircraft torpedo based on the 45-12 (456 mm Pattern 1912) torpedo. Modification of the original 53-27 torpedo. It was unsuccessful and production was stopped in 1938 after about 100 were built. Based on the Italian 450 mm torpedo which was purchased from Fiume in 1932. Could also be used from submarine 533 mm tubes using a special adapter. Design started in 1936 after the failure of the 53-36 torpedo. Based on the Italian 533 mm torpedo bought from Fiume in 1932. Main Russian torpedo of World War II. Loading a torpedo aboard an unidentified surface ship in 1942. Modernization of the 45-36N torpedo to increase the weight of the warhead. 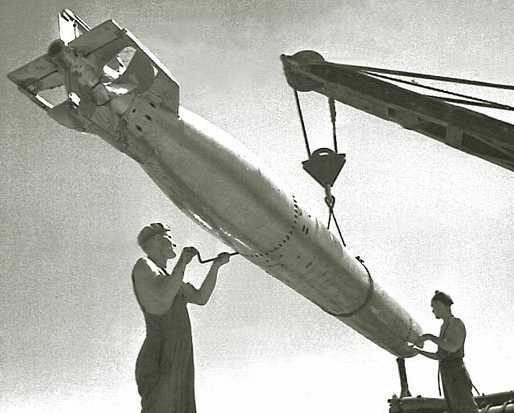 Modernization of the 53-38 torpedo to increase the weight of the warhead. Some of these torpedoes had a magnetic fuze starting from 1942. 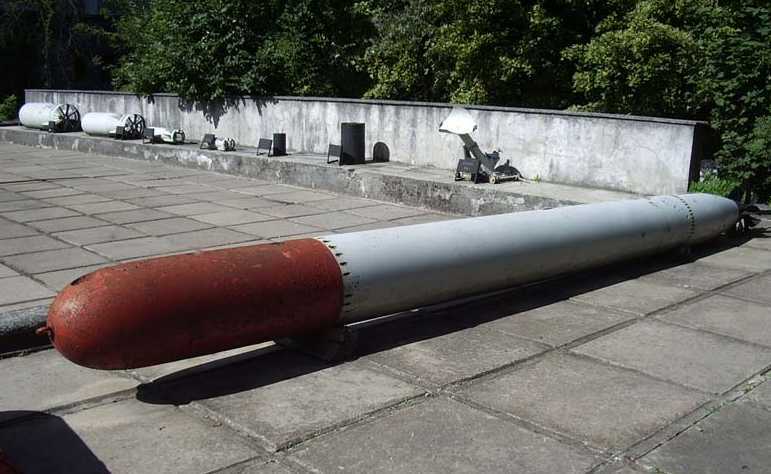 Main Russian torpedo of World War II. High altitude aircraft torpedo based on the 45-36N. Differences consisted of single speed instead of selective one and modification of the torpedo to survive water entry. Low altitude aircraft torpedo based on the 45-36N. Differences consisted of single speed instead of selective one and modification of the torpedo to survive the water entry. Main Russian aircraft torpedo of World War II. Modernization of the 53-38 torpedo with main goal to increase the speed without sacrificing the range. 533mm "53-39" Pattern 1939 Torpedo. Now at the Great Patriotic War Museum, Minsk, Belarus. Photograph copyrighted by Vladimir Yakubov. Post-war development of the ET-80, used parts of the German G7e torpedo.